Add popcorn to a large heat-safe bowl. In a medium sauce pan over medium heat, melt butter, corn syrup, and sugar. Once sugar has completely dissolved, add in vanilla and food coloring (if using) then pour in marshmallow. Stir marshmallows until they have completely melted. Pour marshmallow mixture over popcorn and stir to coat each kernel of popcorn. Sprinkle in sprinkles and fold to distribute through the popcorn. Line the inside of a large plastic Easter Egg with a small piece of plastic wrap. Press the popcorn mixture into half off the Easter egg. Use your finger to press a small indentation into the center of the egg. Fill with chocolate candies. Repeat the step on the other half of the Easter egg, then press the two halves together, firmly. Remove the popcorn balls from the Easter eggs, and wrap the plastic around them to keep their shape. 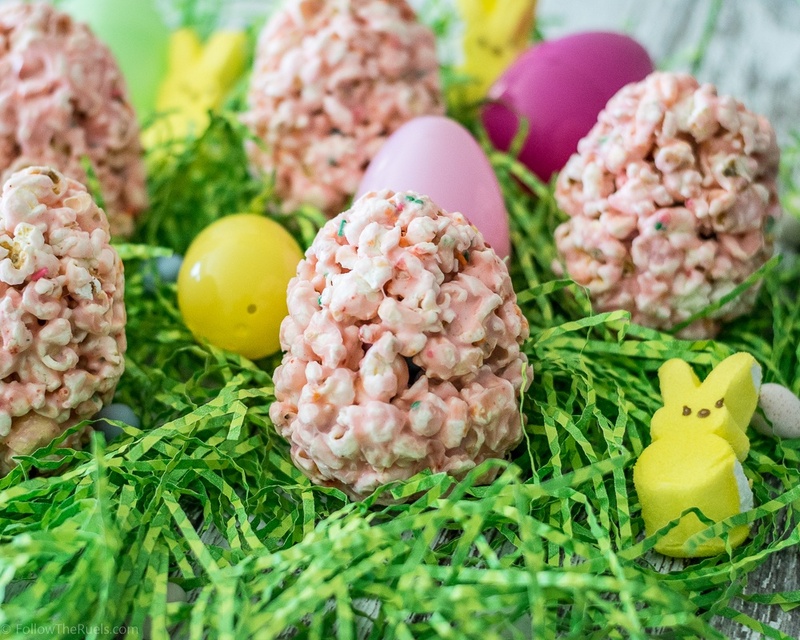 Make 4-5 more Easter eggs with the remaining popcorn. Allow the eggs to set in the plastic wrap for at least 30 minutes before setting out.